Last Saturday morning, Eugene M. “Gene” Lang ‘38 H’81 – former chairman of Swarthmore’s Board of Managers, winner of the Presidential Medal of Freedom, and founder of the “I Have a Dream” Foundation – passed away in his home. He was 98 years old. Over the course of his life, Lang contributed over $150 million to charities both in the United States and abroad, including a $50 million gift to Swarthmore in 2012. Though many remember him for his philanthropy and generosity, Board Chairman Tom Spock ‘78 sees his impact on the world as more than just financial gifts. “His relentless focus on social responsibility, and on the debt to society owed by all those lucky enough to have the privilege of a Swarthmore education, has helped us understand ourselves better, and to aspire to achieve – and give back – more than we otherwise might,” he said in President Smith’s email announcement to the college. Lang was born in 1919 in New York City. The son of immigrants fleeing political persecution in Hungary, he lived in a $12-a-month railroad apartment and attended Public School 121 in Manhattan. After graduating from P.S. 121 at the age of 14, he was accepted on scholarship to Swarthmore, and ended up starting a business that manufactured pennants during his time here. He graduated in 1938 with a B.A. in economics at the age of 19, and went on to receive a Masters of Business and Science degree from Columbia while taking mechanical engineering classes at Brooklyn Polytechnic Institute. Much of Lang’s entrepreneurial fortune stems from the Refac Technology Development Corporation, a company he founded in 1952 that licensed patents and financed high-tech ventures. At one point, Refac held patents on the technology in LCDs, bar code scanners, and credit card verification systems. Refac would use these patents to secure licensing fees or out-of-court settlements with companies like IBM and Radio Shack. He then, on impulse, told the audience that he would award every member of the class that went to a four-year college with a scholarship. After shocked gaps and raucous applause, he said he would set aside $500 per year for each of the students for their college tuition. The gesture ended up receiving national attention, and President Reagan invited him to the White House. It also led to his creation of the “I Have a Dream” Foundation, an organization that works with under-resourced public schools and housing projects to help students fulfill their dreams through personalized support networks, educational assistance, and financial resources. 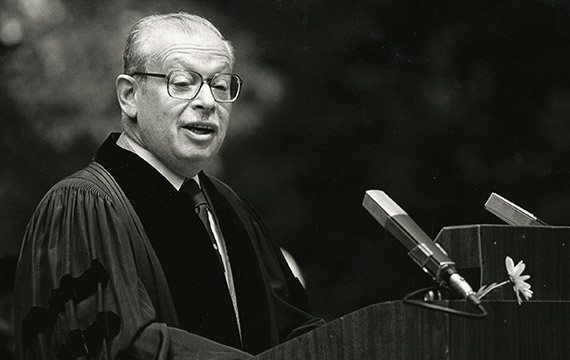 Due to his philanthropy work, Lang was awarded over three-dozen honorary degrees, including an honorary Doctorate of Laws from Swarthmore in 1981. He was also awarded the Presidential Medal of Freedom by President Clinton in 1996. Today, his legacy at Swarthmore lives on through the Lang Opportunity Scholars program, which has supported over 200 social responsibility projects in more than 80 cities across 31 countries. Lang is survived by his daughter Jane Lang ‘67 and his two sons David and Stephen Lang ‘73 H’10. He is also survived by his grandchildren Jessica Lang ‘92, Noah Lang ‘10, Lucy Lang ‘03, Joanna Lang ‘11, Ben, Dan, Grace, and Jacob, along with eight great-grandchildren. Swarthmore President Valerie Smith announced that a funeral service for Lang would held this week in New York City, and a campus memorial service would be announced at a later date.